Hello sunshine, I show you my bare midriff! 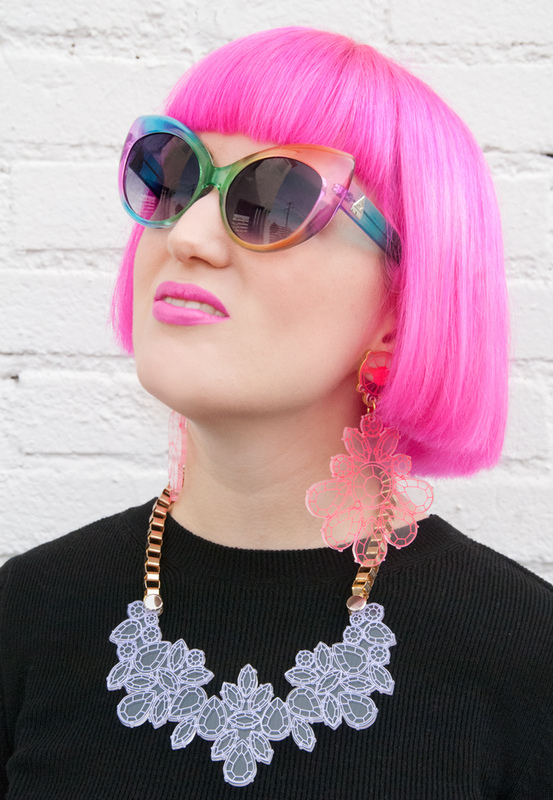 Very pink hair, rainbow glasses and my favourite jewellery from Thailand. 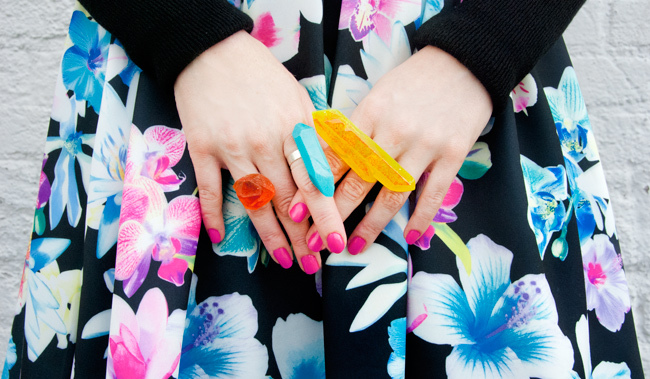 Multi-Coloured Ring Cocktail: Matching my rings to my skirt. The Magic of Black: Doesn't it make my hair even brighter? 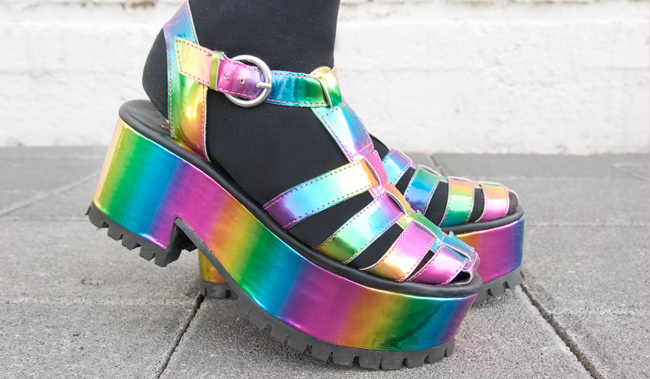 Upppps: You catch me dreaming of rainbows. 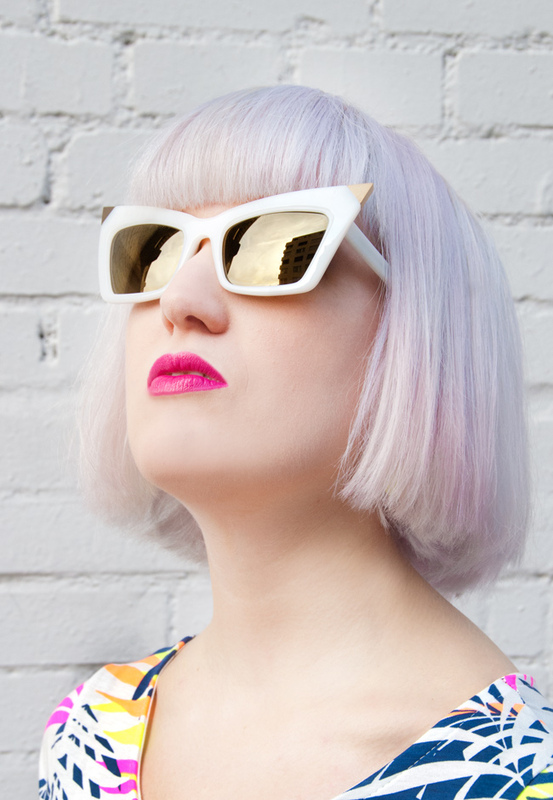 Quirky Alien: No, it's not me, it's my sunnies that turn the look into something from outer space. No Decisions: Just have all colours on your shoes, yay! Ha, I discovered a few rays of sunshine! Time for sandals, flower prints and a crop top with long sleeves (to make sure nobody thinks I'm in the wrong season). I think crop tops are here to stay. The whole bare midriff thing started as a trend, but it's just coming back season after season, and I couldn't be more happy. I love how they look combined with a skirt, for a look without a frozen belly try a high-waisted one. My kidneys prefer my crop top love that way too, but I wish I were not such a sissy when it came to cold. When it gets colder, you will see me sneaking from one heated room to another heated room, I'm just no outside gal, no sir! I wish I could wear sandals the whole year and don't like to look like Rudolph the Red-Nosed Reindeer whenever I go out. Once I met an African woman when my skin was very pink from the cold. She looked at me and just said "White people have many, many colours." I still smile when I think about this, and it's so true. Thankfully, the sun is merciful today and the only thing very, very pink is my hair. The only reason I could ever turn into a winter girl would be if my bob turned as pink as my nose in the cold. Oh my gosh, my living room wouldn't see me again! I hope you're having a sunny day as well, and I'm curious to hear how you like this look. Thanks to Quiz Clothing for the skirt. 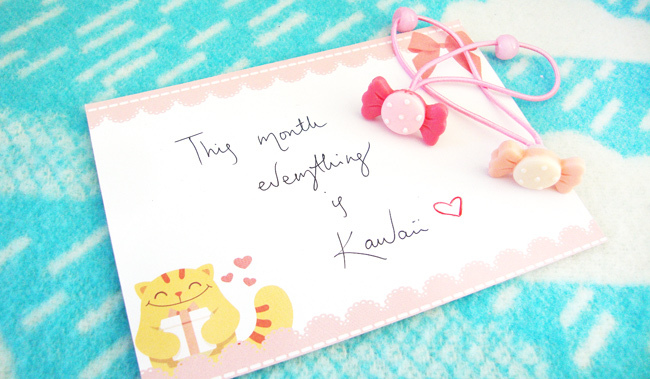 These are the eleven happy things I found in my October Kawaii Box. Loving all my new pink cuties. They arrived to make my life more kawaii. 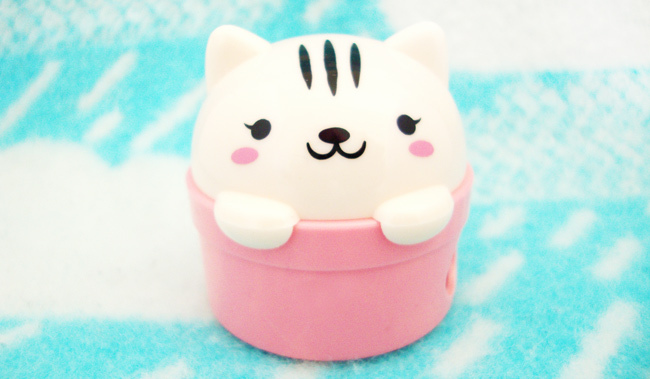 This adorable cat pencil sharpener is my favourite. 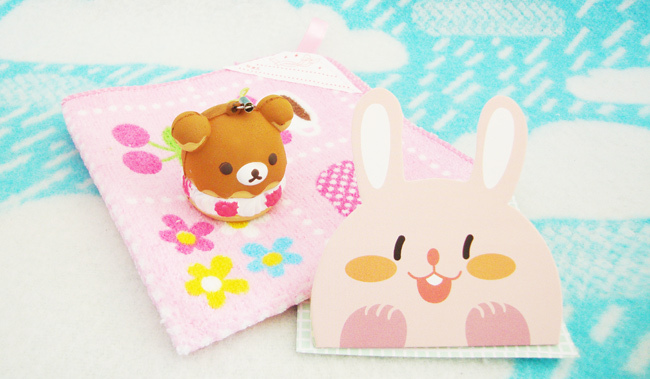 A lovely face cloth, a bear charm and a funny bunny card. 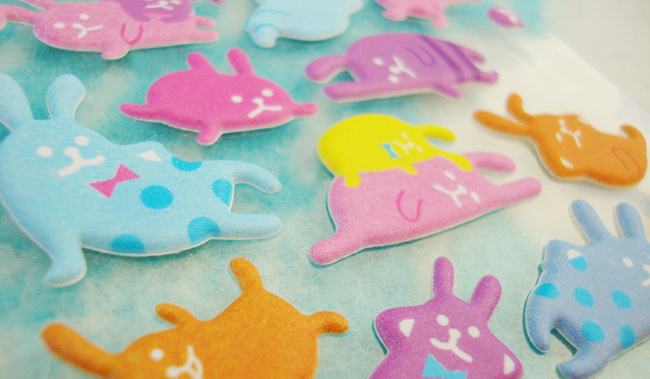 Cute bunny stickers, I'll use them for my mail. This girly bag will be my new makeup bag, yay! Hello bunnies, rainbows and love letters! 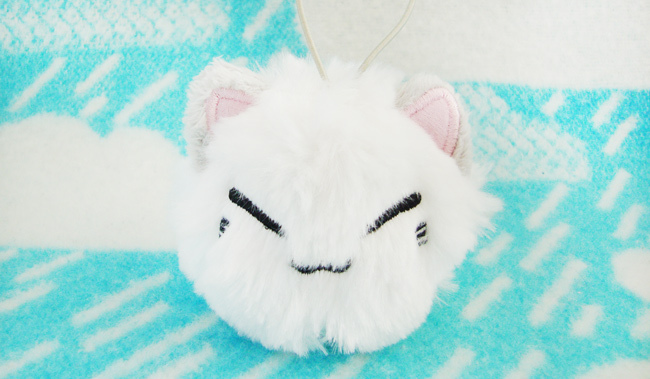 What a fluffy cat plush! I'll decorate one of my bags with it. 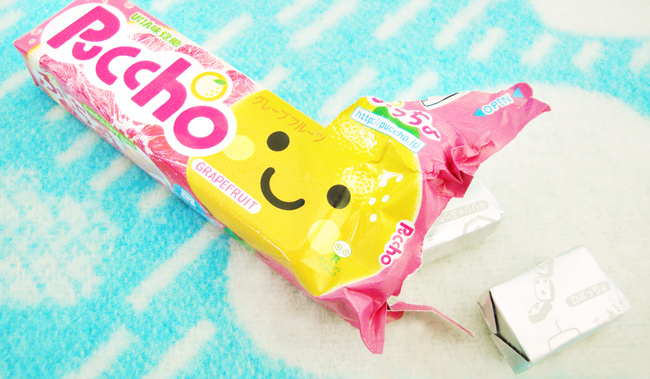 Grapefruit sweets with the most adorable packaging ever. And the best: It's more than just charming when a parcel comes with a handwritten card (and candy hair ties). Thumbs up! Do you love surprises and getting parcels? Then this is one for you! If you subscribe to Kawaii Box, you'll get a box of the cutest items from Japan and Korea every month for just $ 18.90; shipping included. 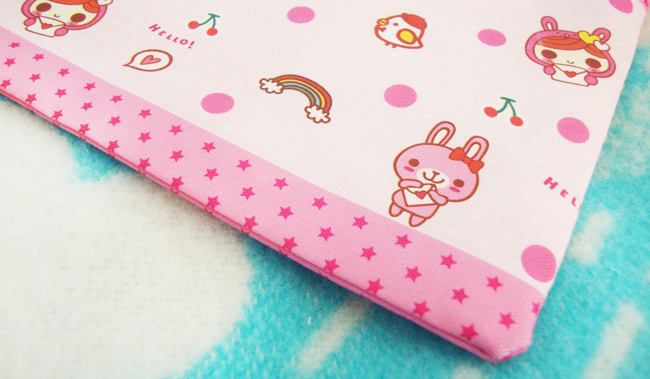 Every Kawaii Box contains 10 to 12 handpicked kawaii items and is delivered to you worldwide. When I was asked to review the October Box, I eagerly checked my mailbox every day, that big was my curiosity to see what cute things I would get. My thrill of anticipation didn't end in disappointment at all when the box arrived perfectly on time. I love about my box that there are two cat items in it – a little plush and a pencil sharpener – and that everything is pink and cheerful. 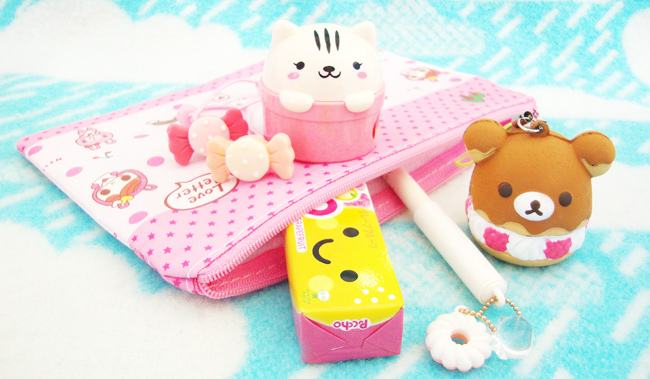 And the best: You can win your very own Kawaii Box, just enter below. Good Luck! Thanks to Kawaii Box for the box. And finally, after a long week, the moment you all anticipated is here: It's Friday, yay! Here is something to keep you pink & happy. Every now and then, somebody declares that either orange, gray or blue is the new black. I don't think there is such a thing as one colour replacing a colour, but pink has been my personal black for quite a while. I recently love to combine different shades together, and I just love my pink hair. I can't imagine to be blond again at the moment. I'm rather a pink candy floss from head to toe, dream a fluffy fake fur, surreal accessories and everything fluffy and cute. I am very excited for the weekend; there are shoots planed and I am excited to prepare my next giveaway for you. Stay tuned, the secret will soon be revealed. I just love to bring a little bit of cuteness into your life. Happy weekend lovelies! Please don't forget to tell me, what you like best from my favourites! I swear, it wasn't me who ate all the doughnuts. How could a pink girl ever lie to you? There is just no reason to eat them, when you can wear them. My perfect doughnut needs sprinkles. Always. Because sprinkles go so well with dots, I love them even more. 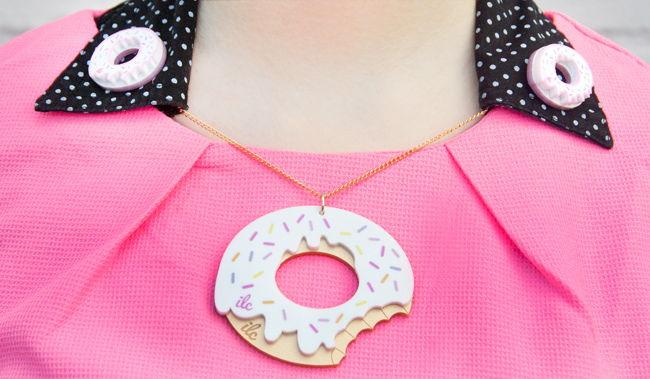 Yummy necklace and collar tips: A winning team. Headbang in pink, this is how I roll! Don't just look at things from one side, the back is important as well. 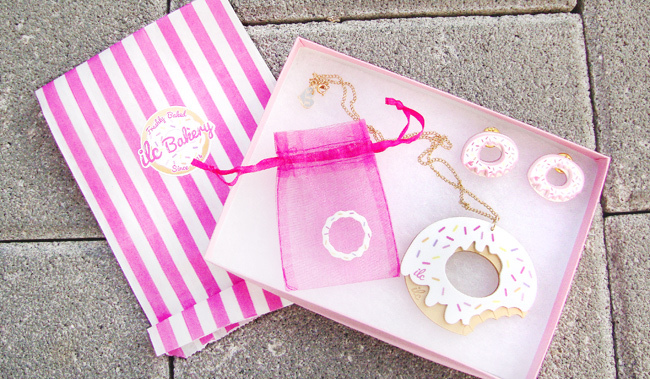 Another thing sweets and jewellery have in common: They both come in the cutest boxes. New boots to start the autumn, I am ready for rain puddles and piles of leaves on my path. What does Homer Simpson love more than anything else on earth? The one and only answer is not his family, his job, his neighbours or his sofa, but Doughnuts! Forget about cronuts they are a strange modern invention, only real doughnuts will do! 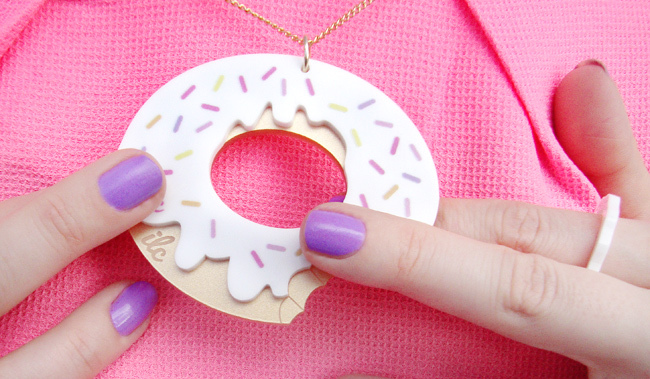 The sweet round rings mean the universe to Homer and so do they to my look of the day. My doughnuts are fresh from the I Love Crafty bakery. If you follow me on Instagram, you might have spotted them there; they caused quite a stir. No wonder, because they are even better than real sugar bombs: No greasy hands, but the full dose of sprinkles and sweetness. Rings, Necklaces, collar tips and bangles and all in different designs (or shall I say flavours?) make a decision very tough if you visit the I Love Crafty store. So the best might be to do it like Homer: Take them all! 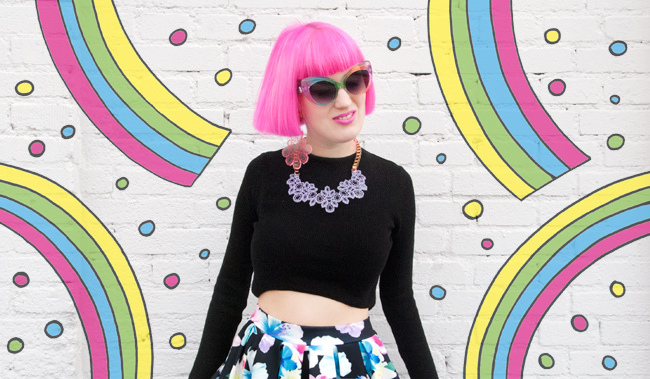 My neon love, which started in the last outfit post, continues. This time with a top from Desire Clothing and nearly neon coloured hair. For once, I wear black boots, I bet something you didn't see on me for a long time. I just loved the quality, and simple style of those shoes and I can wear them with nearly everything. Even a colour explosion girl like me is now and then comfortable with something that suits every look. 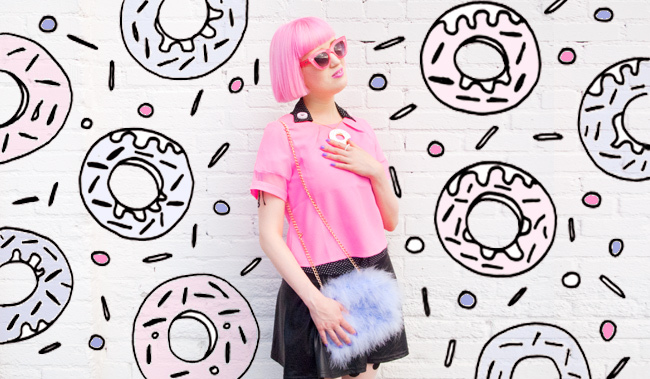 While I don't have to loose sleep over what shoes to wear, there is time to focus on other things: Let's say doughnuts! Thanks to Desire Clothing for the top and to I Love Crafty for the jewellery. Simone Devine is the eclectic Sydney based label by the duo Simone and Scott. 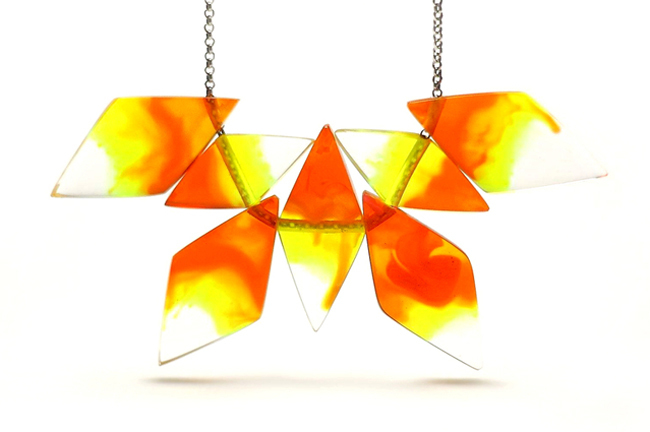 They create and handcraft modern resin jewellery and beautiful vases. 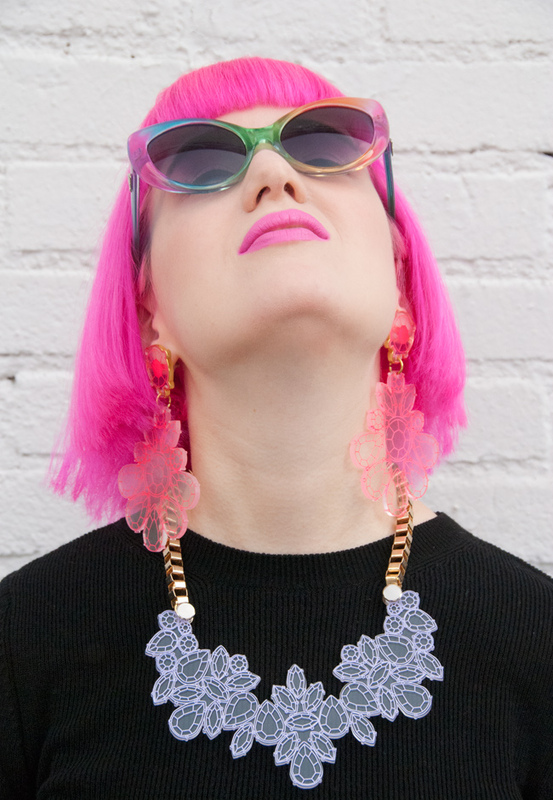 Their geometric-shaped and bright statement jewellery turns even the most boring everyday looks instantly into something special. Every one of their pieces is unique and therefore a precious treasure you won't miss again. Hello Simone, tell me a little bit about how and when you started to design jewellery. Hello! We started one year and a half ago so it's still a relatively new business. It wasn't planned or even preconceived. My boyfriend was working as a surfboard shaper, and I was a visual merchandiser. One night he just said, "I'd like to do something more intricate with my resin skills. ", so I suggested, expecting rejection, "What about jewellery?". He replied "Ok, design something." which was a surprise, but a very welcomed one. You work together as a team with your boyfriend. How do you collaborate? Do you have a special diversion of responsibilities? Although we do share a lot of the responsibilities and designing, there are some things that are completed individually. For example, I like selling our products, so that's something I do. 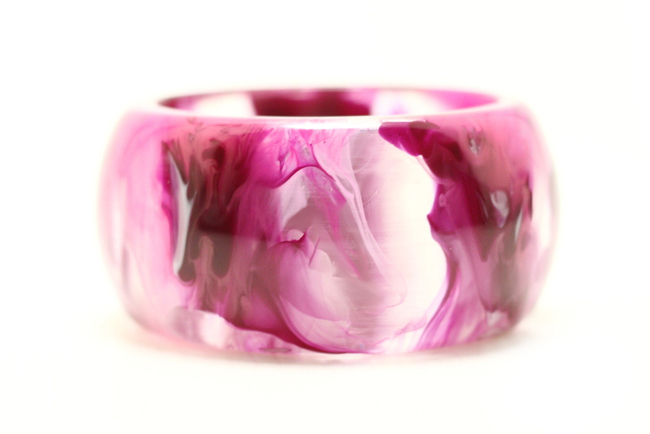 Scott works with the resin because it's something he is very good at. Some things are better suited or more enjoyed by just one of us. 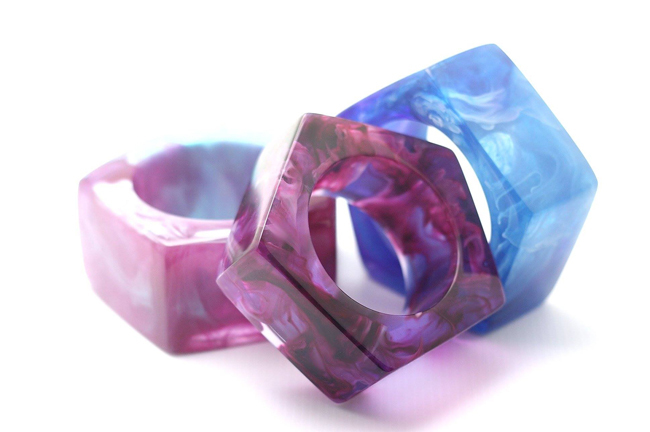 All your pieces are made of resin. 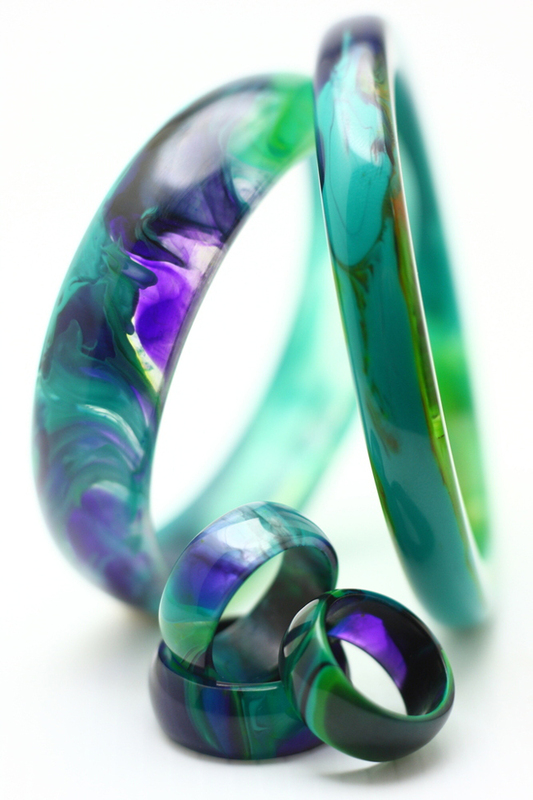 What is your fascination with this material and why is it the perfect choice? Well, I guess it first started out of convenience as Scott already knew how to work with it. Then as we established our aesthetic it became an integral part of what we create. 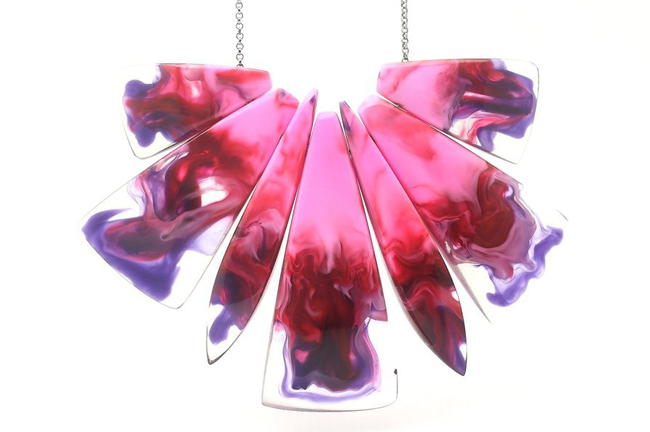 Colour is an essential component of our designs, and the medium resin helps to capture this. On your blog, you share inspiration of how to style your jewellery. What would be your dream look to go with your favourite piece? Something quiet maximalist I think. Although I love how a bright bangle or necklace can set off a more simple outfit, I find it far more interesting when the look is bold and expressive. 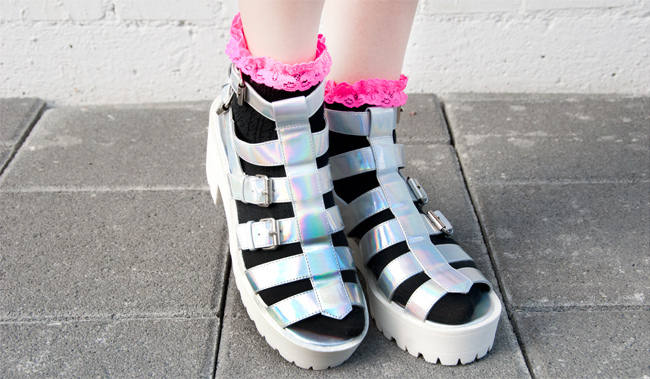 How would you describe the importance of accessories for a look? My best friend once told me "You ARE accessories" because they are always the most important component of any of my outfits. I think accessories can make you feel incredible in a way that is quiet different to clothes. You could practically wear the same outfit every day but by adding different shoes or jewellery you completely personalise the look. I also feel people are prepared to take more risks aesthetically (and I guess physically, when it comes to some shoes) when choosing their accessories. I've sold both clothes and jewellery to women, and I can certainly see a distinct difference in the two; jewellery always makes you feel better when you put it on. Tell me about three things that inspired you recently. Leopard Print: It is a common theme in my wardrobe, but not usually an inspiration. 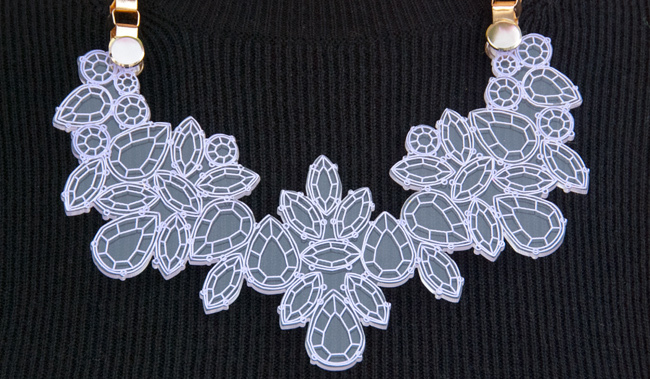 We have just created a necklace in ode to the iconic print. Pink Glitter: I can't get enough of the stuff. Turquoise: This colour is so refreshing. Do you have idols who inspire you? I am most inspired by clever people who look like the are enjoying themselves. Last but not least: If your jewellery would be music, how would it sound? Visit Simone Devine here and don't forget to follow the label on Facebook. Copyright of all pictures by Simone Devine. 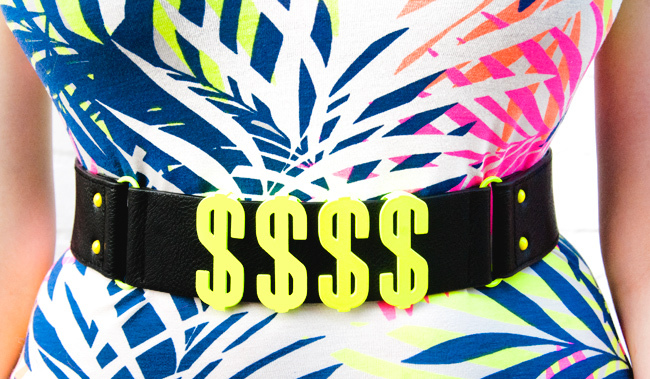 Neon Palms: A striking print in flashy colours is always a winner. Cool in Neon: A very urban look against the grey in the city. Edgy Cat Eyes: The golden edges are the icing on the cake, don't you agree? Monsters at the beach: I couldn't resist wearing my Joanna Pybus monster clutch. It even goes with tropical prints. In love with the bodycon dress: the best piece of clothing to show off your curves and be proud of them. Despite my last autumn look, I am back to a summer outfit today. I spent last weekend in a sunny London. 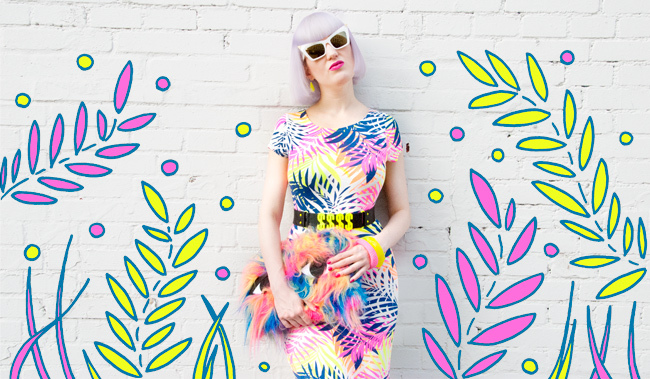 The desire to dress to be a walking colour boost is stronger than ever. London always encourages me to be the boldest me I can imagine. Thank you, best place in the world, I love you just so much. I also went shopping a little at the weekend and bought a few things for winter. But as long as the weather allows, I'll continue to be your summer girl and stick to my sandals and bare arms. The time for scarves and heavy boots will be long enough. It's good to buy them now and be prepared, but they can stay in the wardrobe for a while. The current whitish/greyish shade of my hair makes me feel a little bit like an elf. Doesn't it work very well with the bright neons, because of its (almost) absence of colour? It feels edgier than my usual pink hair, especially which those Alexander Wang sunglasses. The lilac hair dye fades even faster than the pink one, and it turns every day into a new shade. Yesterday it was very bluish. I'm going back to pink very soon because my heart just beats for the Barbie colour. But a change is always good, my lovelies. Never stop to change, embrace it and let it carry you away to places better than you could have ever imagined in your dreams! Thanks to Desire Clothing for the dress and shoes.